LAS VEGAS, Nevada -- Las Vegas police now say one suspect is 'down' and authorities don't believe there are any more shooters, following a mass shooting at a music festival on the Strip that killed at least two people and wounded dozens late Sunday. Dozens of patrol vehicles descended on the Strip after authorities received reports of an active shooter near the Route 91 Harvest Festival. Las Vegas police later said one suspect is "down" but did not give any other details. 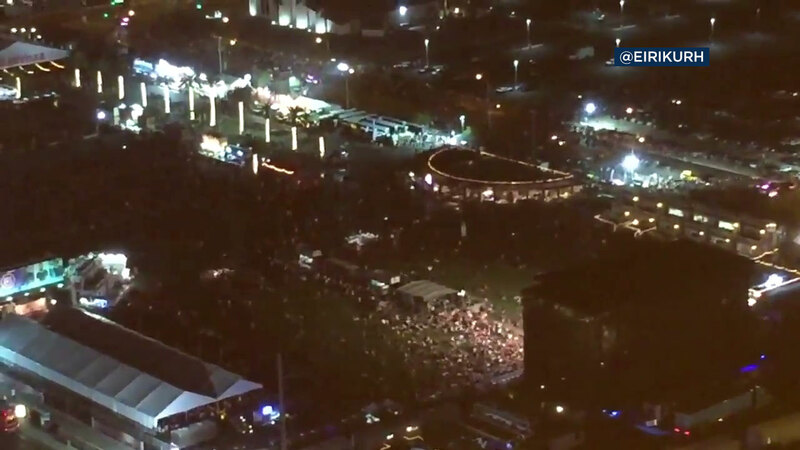 Concert-goers reported seeing muzzle flashes from the upper floors of the Mandalay Bay Hotel and Casino across Las Vegas Boulevard from the country music festival and the sound of what they described as automatic gun fire. Twenty-six people were admitted to the hospital, University Medical Center spokeswoman Danita Cohen said. Of those, at least two died, 12 were in critical condition and the rest were being evaluated, she said. Witnesses said they saw multiple victims as they fled the gunfire raining down on the concert venue. Some later huddled in the basement of the nearby Tropicana hotel-casino. Authorities shut down part of the Las Vegas Strip and Interstate 15. Some flights destined for the McCarran International Airport were diverted due to the shooting. Witnesses say country singer Jason Aldean was playing near the end of the concert when gunfire began. Police are investigating reports of an active shooter in the area. DEVELOPING: We will provide updates as more details become available.